Hand-blown by Robert Kuster, these vibrant glass balloons will be the life of the party. Is That Helium Holding Them Up? 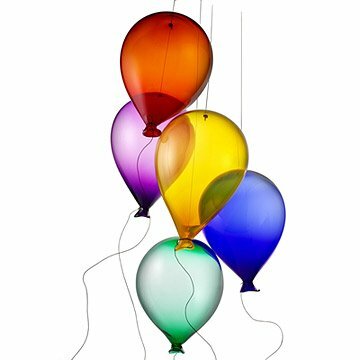 Set these vibrant hot glass balloons aloft and they'll create a striking, festive atmosphere. Designed and hand blown by Robert Kuster, the balloons will mesmerize your guests as they hang from barely visible thin metal wires. Choose from five jewel-tone colors: orange, yellow, green, blue or purple. Handmade in the USA. Robert Kuster began blowing glass years ago as a “second career” and has achieved what most artisans may never achieve in a lifetime. His work is found in the most prestigious galleries in North America, his chandeliers grace magnificent homes, hotels, upscale restaurants, and many other public installations across the country. Robert’s work is inspired by the organic forms in nature. He has always incorporated the shape and color of vegetation from flowers, bamboo, seaweed and fruit. Nature as afforded Kuster unlimited shapes, colors, and texture and his work has ranged from large hand blown glass flowers to vivid multi-piece glass sculptures. Artist card included. Hanging hardware not included. They make us happy when we see them. Now that we have hung the glass balloons we are very pleased with the result. The variation in sizes of the balloons add to the dimension in the grouping. As long as the variation is not too great, it works well. We have purchased these balloons over a few years now and plan on hanging them together around a light pendent fixture. The original balloons were a nice size, 13-14" in height. The last 3 balloons i received were barely 10" and smaller in diameter, a big difference in comparison to the original purchased ones. I am disappointed in the smaller size, for the same price as the larger ones, and the only option offered was to return them. Customer service said they still fall "within the normal range" but it makes me wonder if the supplier has changed their product. I don't think I will be buying more of these. love them but how to hang from ceiling? I love the balloons but am having a dilemma on how to suspend then from the ceiling. The wires are too short as I would like to hand then at different heights. Any ideas? I bought this for the person who has everything . It's was bigger than I thought which I was happy about. I know she will be thrilled when she opens it . The reason I like shopping here is because they have different things you don't see all the time . I hung five different colored (and shaped) balloons at different levels in a large office waiting room window opening. They're just spectacular, serving to decorate wonderfully and also, functionally, to provide an additional measure of separation between the areas.